There was a lot of talk about place and where you come from at Going West this year. I live in West Auckland but seem to come from many places so don’t think of myself as a West Aucklander. I have anchors here and anchors elsewhere, but I have strong attachments to my local literary festival. 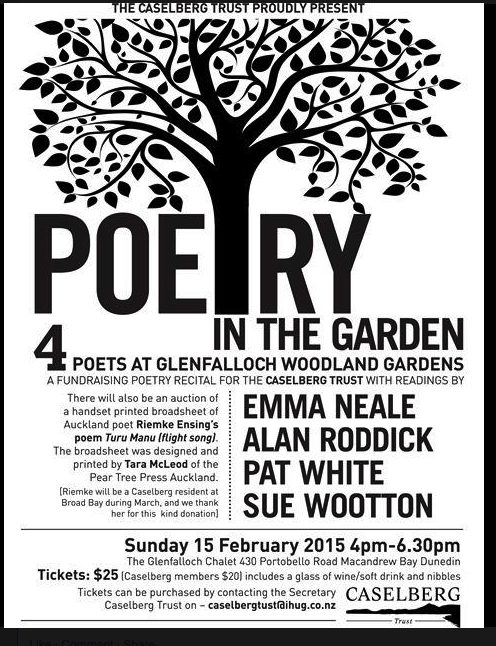 I like the way it embraces a literary whanau. We share very good food and we share stories. Like other New Zealand writers I am very grateful for the local festivals that celebrate local writing no matter the degree of international presence. Earlier this year I flew to Wellington to see The National Library’s fabulous Circle of Laureates event. It was a very special occasion but I was hard-pressed to find many other local fiction or poetry events at the festival. I see this as such a loss – not just for Wellington readers and writers but for all of us. Auckland seems to be upping its game at their major festival. The dedication to New Zealand writing of all ilks is tremendous. It is a huge festival, overwhelming in terms of crowds and choice, but every year I come away rejuvenated as both reader and writer. Going West is one of our key local festivals — 100 per cent devoted to New Zealand writing that crosses a range of genre, subject matter and format. This year was no exception. With new programme directors (Nicola Strawbridge and Mark Easterbrook) things were slightly different but the end result immensely satisfying. My only regret was the little poetry slots that used to pop up between longer sessions. I missed those. The sun shone, the food was as good as ever, and I came away with a stack of books to read. Hearing Damien Wilkins read from Dad Art (two extracts) and share ideas and anecdotes with Sue Orr was so good, I raced to get the book. I loved the detail, the humour, the premise of the book, the absolute warmth and human pulse. This book deserves a wide readership. I got to hear Emma Neale read as the Curnow Reader with her pitch-perfect melody, tender eye and acute detail of family (among other things). Emma was also in conversation with Siobhan Harvey about her new novel, Billy Bird, and again an extract from the book and a fascinating conversation made me race to get the book. Already I am drawn to this curious boy who thinks he is a bird. Emma will also read from this at The Ladies LiteraTea in October. Albert Wendt gave a terrific speech on Friday night that rattled our literary complacency. Where are the Pacific voices? he asked with both fire and poetry in his belly. I missed the Poetry Slam but saw Robert Sullivan in conversation with Gregory Kan and Serie Barford. Thoughtful questions that included rocks, sediment and the thorny issue of revealing family. I came away thinking if I were a book-award judge this year I would honour This Paper Boat as it resonates so deeply with me. Then there are the sessions you have no familiarity with. I loved a session on NZ rivers, for example, and came home with books on that topic (Dr Marama Muru-Lanning). I ended the festival (I missed the beer session sadly) with the conversation between John Campbell and Roger Shepherd. A perfect close for me because it took me right back to listening to music in Auckland in the 1980s when I wasn’t listening to music in London (82-86). It was funny and sad and surprising and nostalgic and inspiring. How lucky we are to have John on National Radio bringing us stories that matter and ask questions that matter even more. Thanks Going West. It was a privilege to be a small part of your festival on stage and a member of the audience over three days. I came away exhausted yet full. Festivals like this ( I am thinking of the ones in Nelson and Wanaka too) matter. Congratulations team – it was a fine occasion – like a family picnic in a way. There was warmth, prickly questions, delicious connections, challenging ideas, good stories told, a generosity of ear and mouth. Bravo! PS I went early one morning so I could breakfast on delicious Turkish eggs at Deco, the Lopdell House cafe. Great view. Very good food and coffee! Highly recommended. This entry was posted in NZ author, NZ Literary Festivals, Uncategorized and tagged Albert Wendt, Damien Wilkins, Dr Marama Muru-Lanning, Emman Neale, Going West, Gregory Kan, John Campbell, Mark Easterbrook, Nicola Strawbridge, Robert Sullivan, Roger Shepherd, Serie Barford, Siobhan Harvey, sue orr on September 12, 2016 by Paula Green. To celebrate my new poetry collection, Fairfax invited me to share some book titles for their regional papers. It is very fitting the weekend I am at the glorious IBBY Congress in Auckland, my first pick is by Margaret Mahy. No matter what I write, Margaret Mahy’s fiendishly elastic, daringly inventive way with words is like my phantom grandmother. Take a lion, a matchbox, a boy and a mum and you get a classic story to which New Zealander writers are all in debt. The ending is genius and still gives me goosebumps. This entry was posted in Uncategorized and tagged Bill Manhire, Cilla McQueen, Emman Neale, Margaret mahy, New York Pocket book on August 19, 2016 by Paula Green.